At The London Vein Treatment Centre, we understand that thread veins can prove to be very embarrassing as they become prominent and visible on the skin. Thread veins are in some ways a smaller version of varicose veins. They are closer to the surface of the skin. However, unlike varicose veins, they do not have the twisted/bulging appearance which is caused by a breakdown in the vein structure. They are therefore not uncomfortable and not considered a medical issue or risk. They are often visible on the surface of the thighs, backs of knees, calves and ankles. While this might be considered an aesthetic issue, there are practical consequences. For example, many patients report that they are forced to wear uncomfortable tights or trousers in summer for fear of their thread veins being commented on. 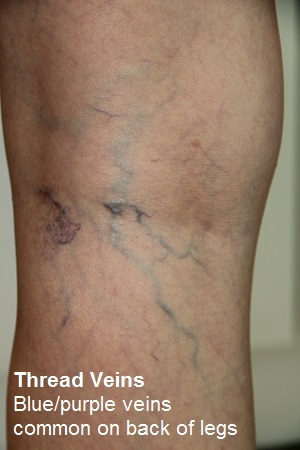 Dark purple thread veins and broken veins are common on the thighs. These are perfect for treatment with sclerotherapy injections or ND Yag laser. Reddy blue thread veins are a common problem behind the knee area. Thread veins are also commonly found on the calves, where the network of red/blue visible veins can cause great aesthetic concerns. What Causes Leg Thread Veins? At The London Vein Treatment Centre our vascular surgeons have helped many patients to regain their lost confidence back by giving helpful advice as per the relevant treatments for the thread veins condition. We, at The London Vein Treatment Centre offer treatments that can be started as early as the appearance occurs and our treatments include Sclerotherapy and laser treatment. These treatments have shown lasting results and are very cost effective. Leg thread veins are ideal for treatment with sclerotherapy injections, which are available at all our London clinics. ND Yag Laser is a new option for smaller thread veins.